We were stirring at daybreak once again in anticipation of a huge mileage day to finish off the tour. Stopping short of the Kelvin trailhead left us roughly 85 miles from the finish. That ruled out any play time at Area 52, so we'd take the bypass through there. My GPS was charged, so I thought, as we began pedaling sometime after 7a. 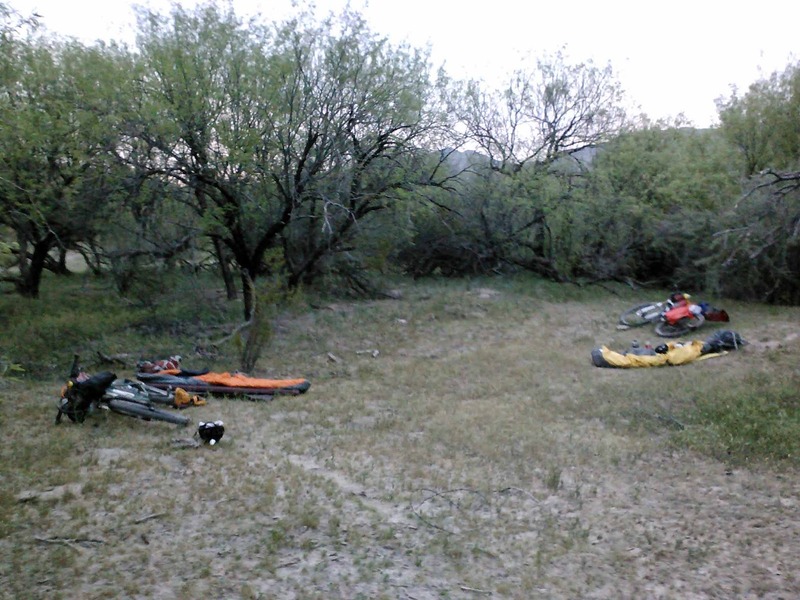 Our campsite down by the river. 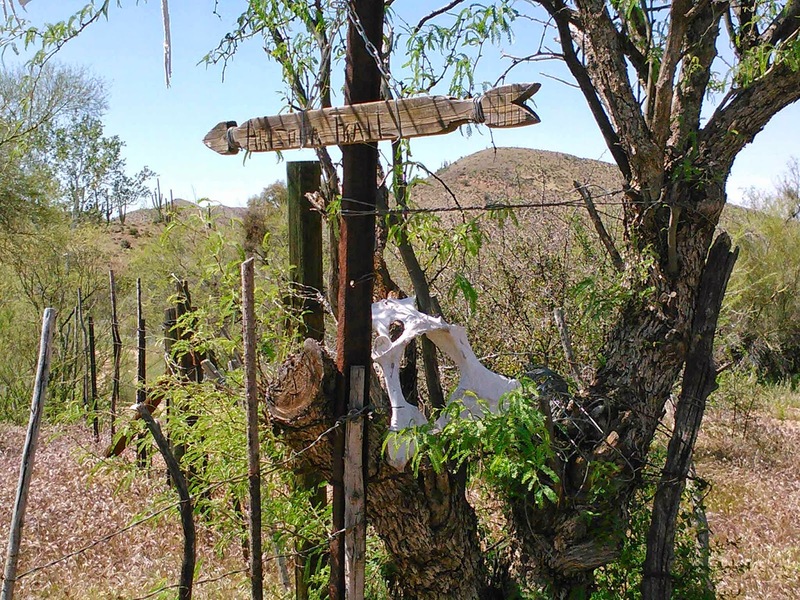 The gate appeared quickly allowing us to warm up our legs on a few miles of easy dirt road. We even caught a glimpse of a white-tailed deer hanging out!! 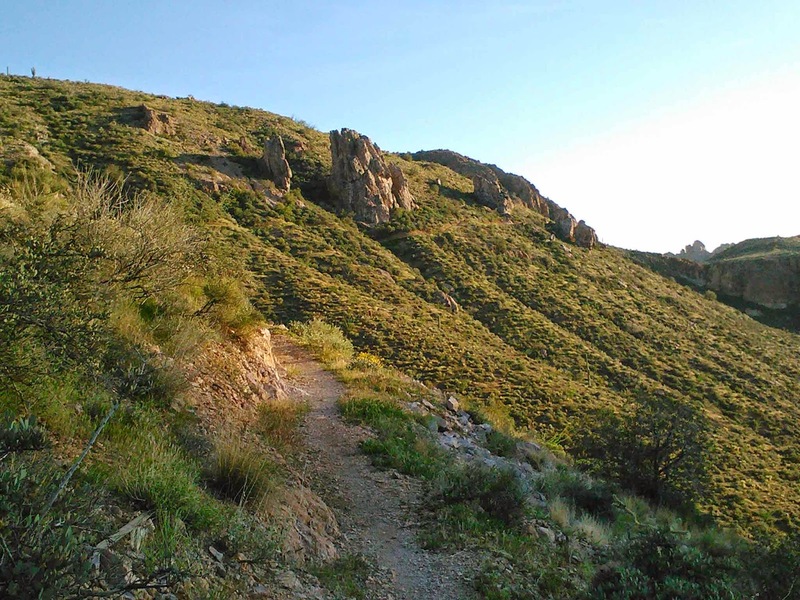 During the next couple of miles the trail contours the hillside along the Gila mixing in short steep climbs and fast fun descents. Every once in a while a nice view of the water appears below. 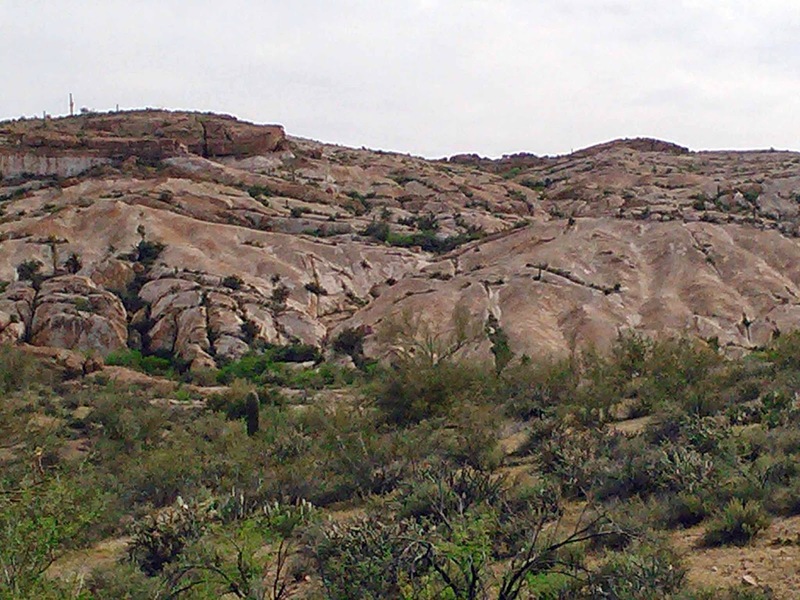 A river of life in the otherwise arid desert. Our day was barely 30 minutes old when my Garmin alerted me of a 'Low Battery'!! Really? It was showing a full charge back at camp. Larry's charger had already been max'd out, so he was running on empty as well. It wasn't a real cause for concern as I knew the route...mostly. There were a few turns here and there that I would need to consult on my electronic friend. I typically get an hour or two of life from the GPS after the first warning, so I knew time was limited. I was more bummed about not recording an 'official' track. 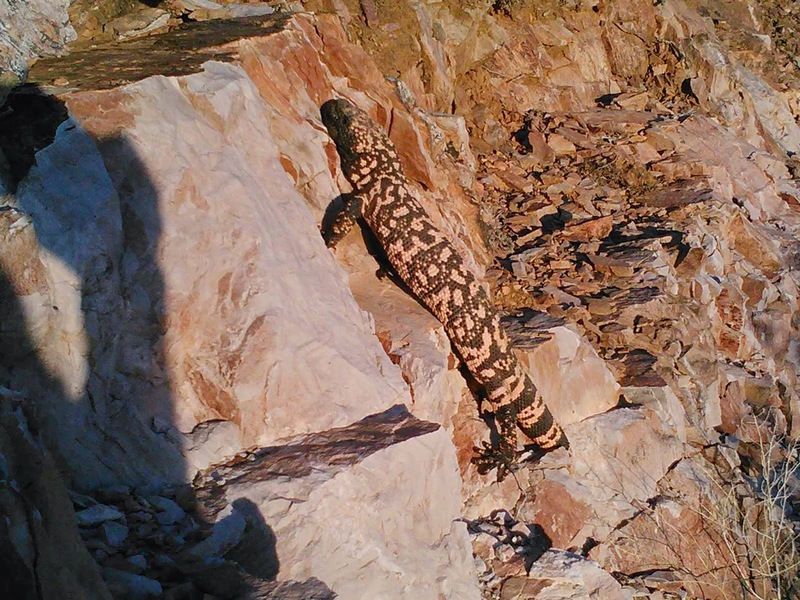 The Gila can be a dangerous place if you're not paying attention!! The guardsmen were keeping a watchful eye on us. This pea-sized pebble sliced my tread like an arrowhead piercing flesh. I heard the pssssttt the instant it happened. I quickly got off the bike and spun the tire to get the puncture to seal, no luck. I lost all the sealant in a flash. 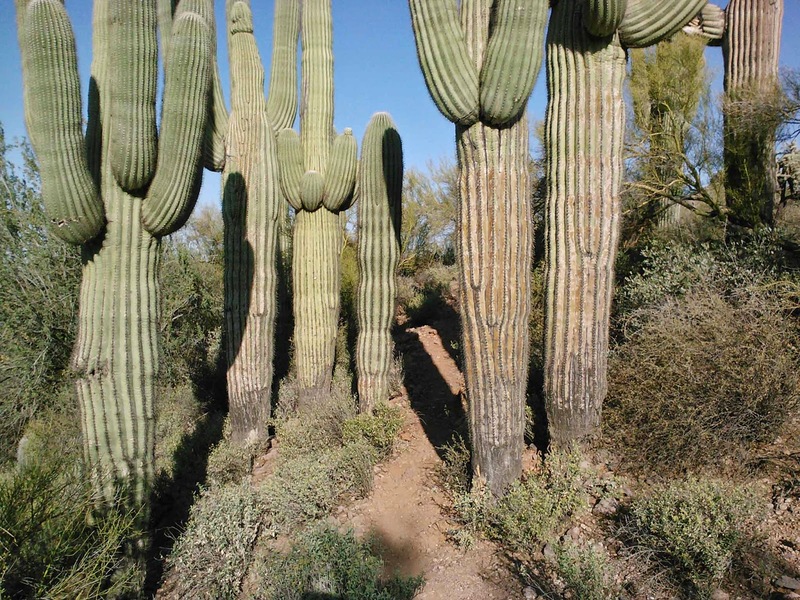 At first glance it looked like a giant cactus barb was lodged into the tread. I tried a couple unsuccessful attempts to inflate the tire in hopes the sealant would finally plug the leak. As I was about to accept the fact that a tube was needed, Larry remembered he had some tire bacon!! Nancy had used one of these plugs before and I really wanted to keep my setup tubeless. The first plug only lasted a short bit, operator error I'm sure. I don't think I inserted it far enough into the tire. 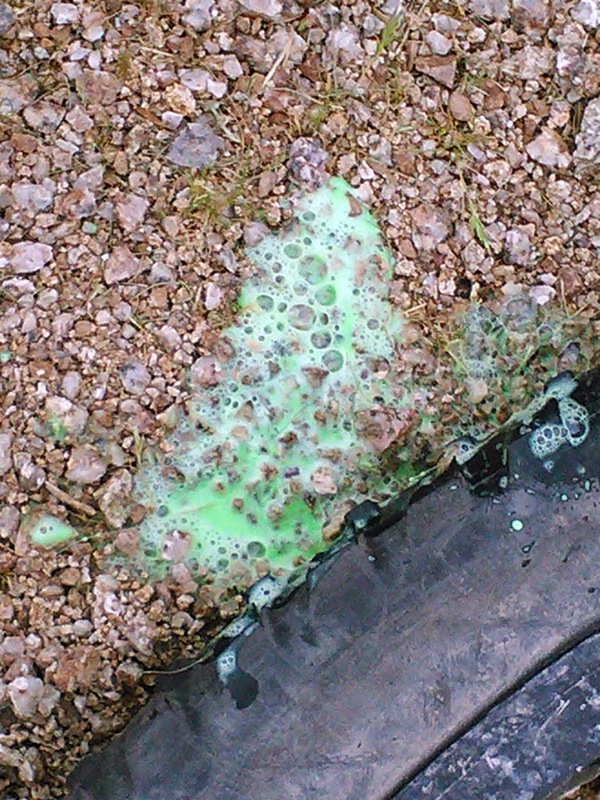 The second plug did the trick and armed with a fresh bottle of sealant, I was good to go. A couple of miles later the GPS died for good. This was now the second time during a 3-day ride that I've had power issues. I had been typically getting 3 or 4 full charges on a set of AA's. The only thing I can think of is the charger doesn't power off during the night after supplying a full charge to the device, draining the batteries. The charger was giving me enough juice to power up the GPS long enough to see if we were on/off route. That was the game we played until the finish. Larry making his way up the Electric Ave climb. Getting close to Kelvin, one 'little' climb left. At the top the wildflowers were once again on display. 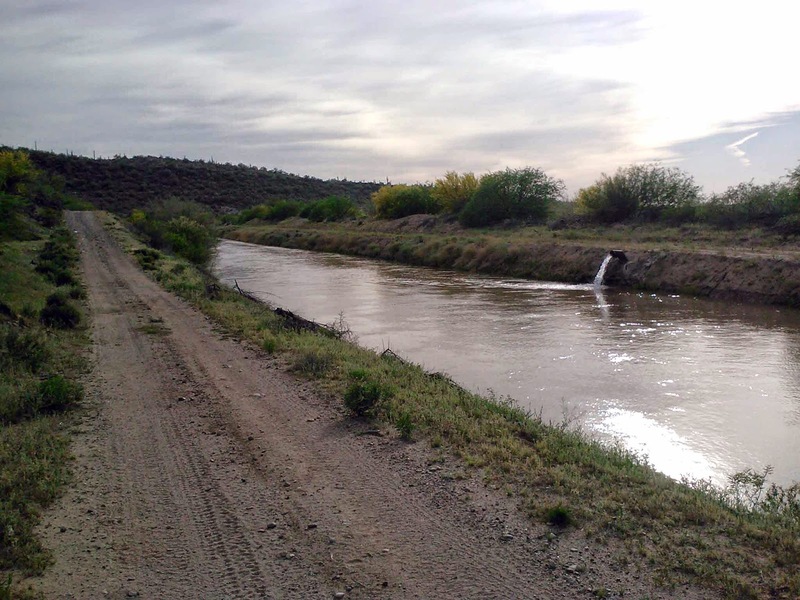 We reassessed our water down at the auto crossing of the Gila River. We were ok, so we kept going. Up at the Kelvin trailhead we topped off at the cache. It was now 12:30p and this is where we thought we'd be camping the night before. 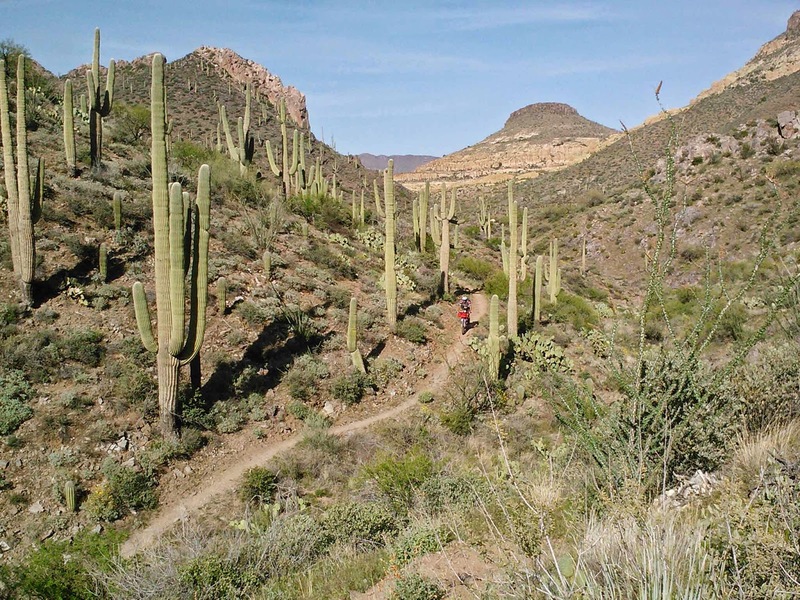 The goal now was to get to Florence before nightfall while not getting lost in the maze of jeep roads in Gila country. 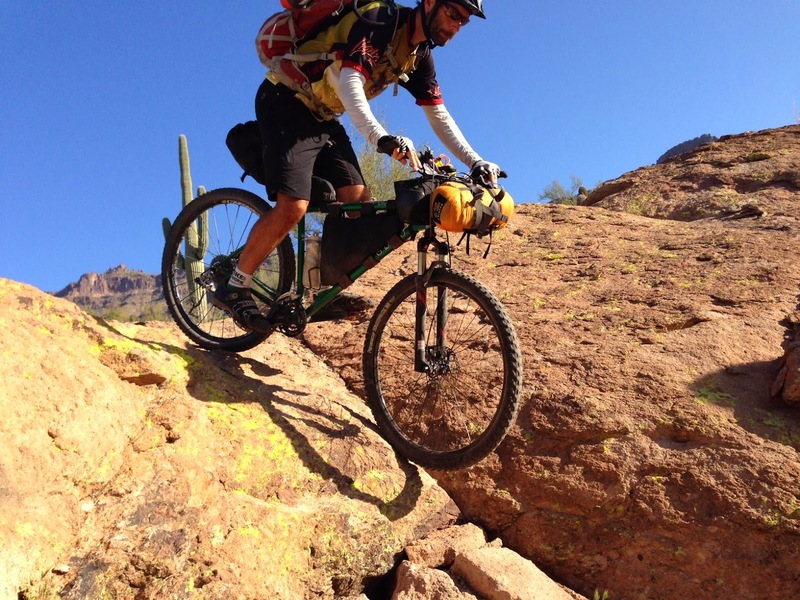 Climbing away from the Gila River on the AZT. 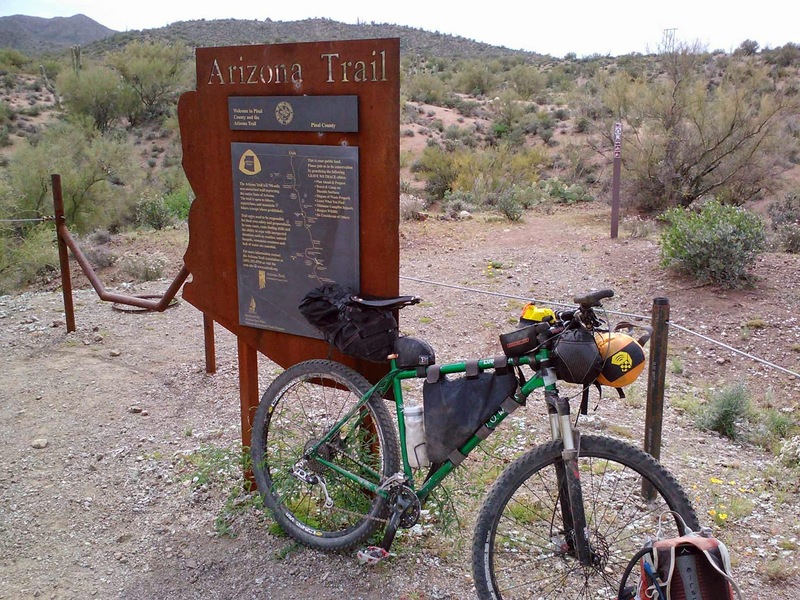 Kelvin trailhead, end of our AZT segment. 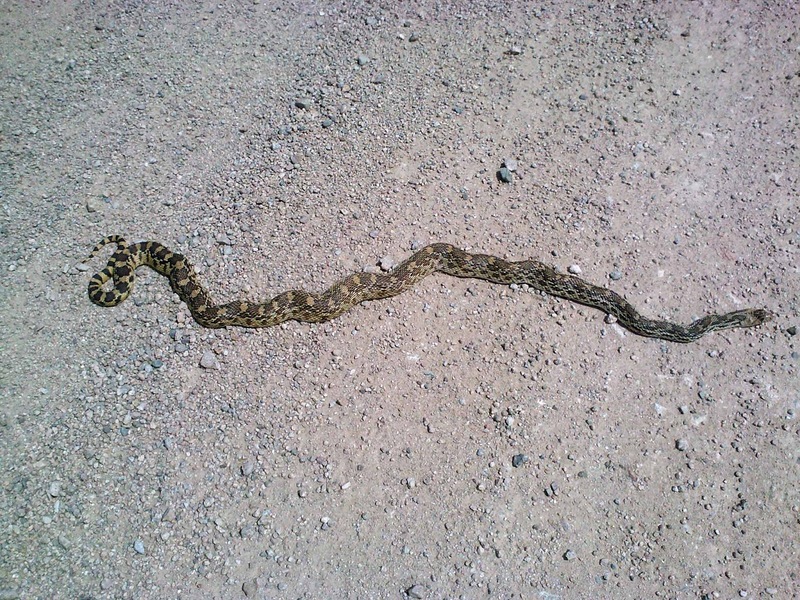 A 6' Bull snake lying across the Florence-Kelvin Hwy. We were now on our last real effort of the ride, the 4+ mile slog up the Florence-Kelvin Hwy. It wasn't too bad on a loaded bike as I settled into a rhythm spinning the middle ring. I was still very glad when I cleared the final crest. Larry topping out the F-K Hwy climb. I cycled the GPS power to get my bearings, turn here, then the second left out to the power sub-station. Go. I/We were really looking forward to the long gradual downhill over to Area 52. However, I made the mistake of trusting my memory instead of verifying with the GPS. We veered slightly left at the sub-station instead of staying straight. This kept us under a set of powerlines. The initial mile or so looked familiar enough and it was downhill as expected. Then it became sandy, real sandy, but still rideable. When I pulled out the GPS I saw we were off-route, paralleling the course too far to the south. Drat. We kept our eyes peeled for a split to the right so we could re-join our track, but one never really materialized. More sand for us. Sandy, yes. Still riding and trending downhill was a bonus. Multiple checks of the GPS later, we finally met up with the intended route just as we were hitting Area 52. A short HAB section through some deep sand led us to a very rugged 4x4 road. We bounced our way through topping out after a couple of miles. Great fun for a 4x4 enthusiast. Area 52. 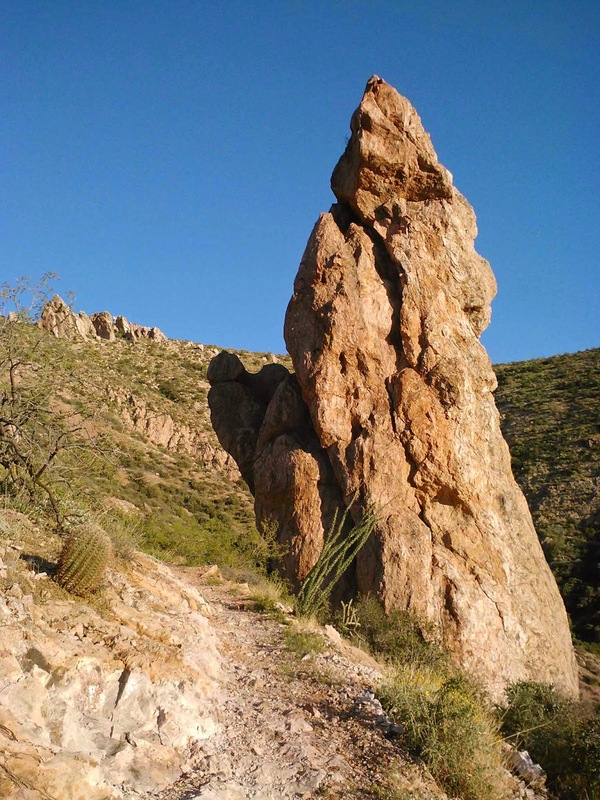 A giant freeride rock outcropping in the middle of nowhere. 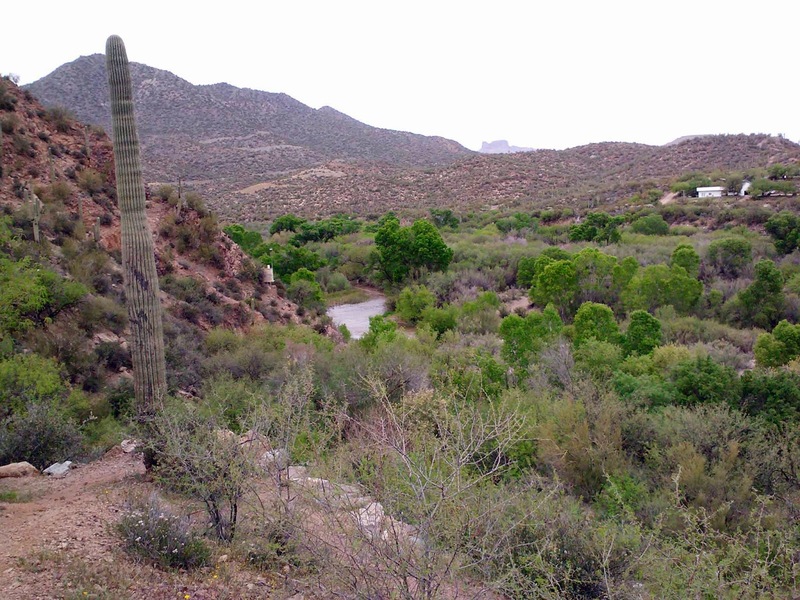 Looking back at the Gila River Canyons. We were now on the fast track towards Florence. 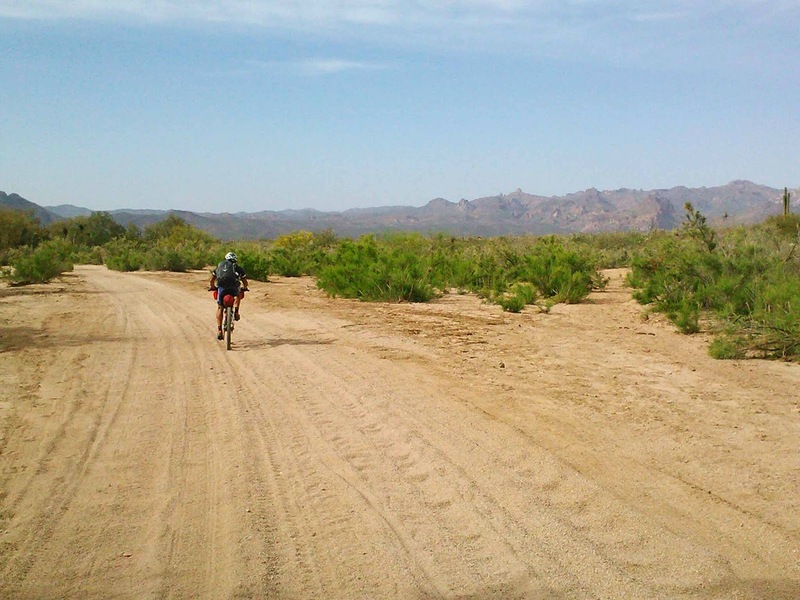 Miles and miles of 2-track skirting the southern flanks of the Gila River. 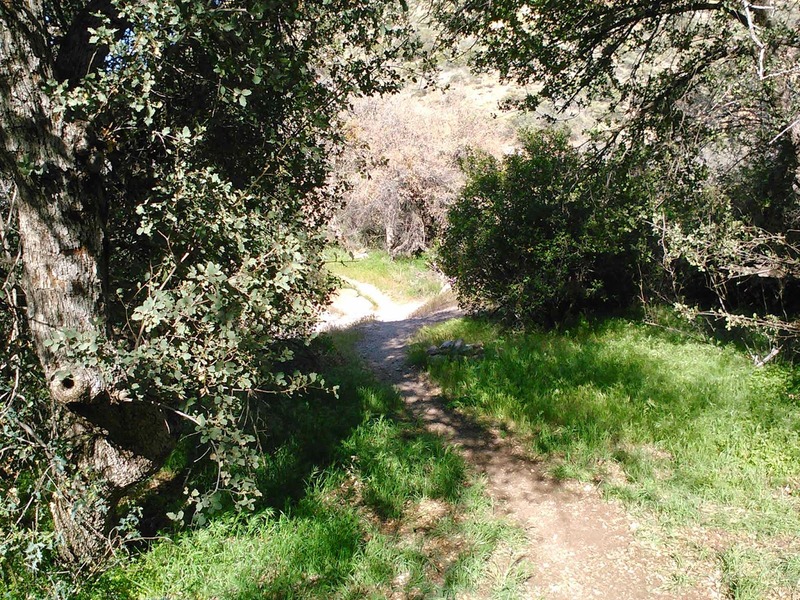 We never really saw the water along this section, but riding under a canopy of mesquite trees told us it was just over the embankment. The afternoon wore on and our discussions trended towards topics of food & drink. We were ready for Florence!! I was ready to see the gauging station signaling our crossing of the now diverted Gila waters leaving us only 7 miles from dinner. We were now on a river frontage road providing us with panoramic views downstream. As we rounded a corner a car was coming our way!! We were surprised to see anyone out here, especially in a sedan. It was the first person we'd seen since passing those riders back near Picketpost a day earlier. We moved over to pass by the car when the driver leans out...it's Arturo!! He has ice cold drinks too!! He SPOT tracked us knowing we'd be low on supplies by now and how right he was. I don't think we said too much before ravaging the cooler for Cokes & Gatorades. That really perked us up. It made the last 7 paved miles into Florence a bit easier to tolerate battling a stiff headwind. Two happy campers at Arturo's SAG wagon. We arrived into Florence with plenty of daylight to spare. Grabbed a high calorie meal, then prepared for some night riding for the final 40 miles. We left town right after sunset. Walker Butte in the distant far left, Poston Butte in the foreground right. The first order of business, stay on the southside of the canal to avoid the often loose dogs on the northside. That worked....until the dogs ran through the dry canal bed and began chasing us!! Time to crank!! They didn't pursue for long as we hit the Hunt Hwy frontage road. We quickly churned out the miles. 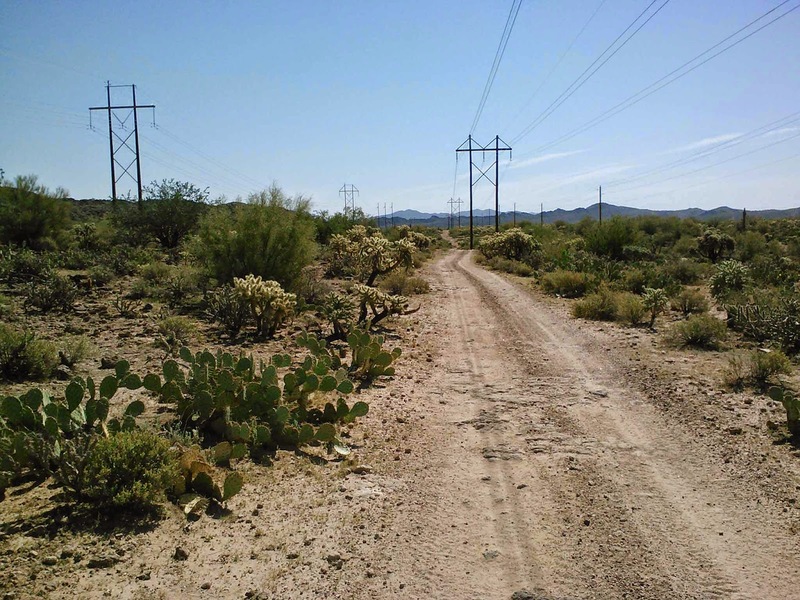 We left the Hunt Hwy corridor in favor of some seldom used dirt roads near Walker Butte. I met up with Larry at the Hunt Hwy and was about to consult with the GPS to find our next entry point back onto dirt when something wasn't quite right. The GPS was GONE!! I have two mounts on my handlebars, the main centered mount I use all the time and a second mount to the right that I use when I have to run the unit directly off of the charger. Unfortunately, the second mounting clip has been broken. My short-term remedy was to use a couple of zip-ties to secure the GPS to the handlebars. It has worked a few times recently, but not on this night. Somehow, the unit slid off the mount and worked its way undone from the zip-ties somewhere along the remote dirt road. I was very upset. I can't afford a new GPS right now, plus all our ride data was gone. Boohoo. Larry kindly offered up his GPS if I couldn't find mine as his was the same model and he rarely used it. I opted to not go looking for it in the dark, but would come back early the next day. It HAD to be there, lying in the road. 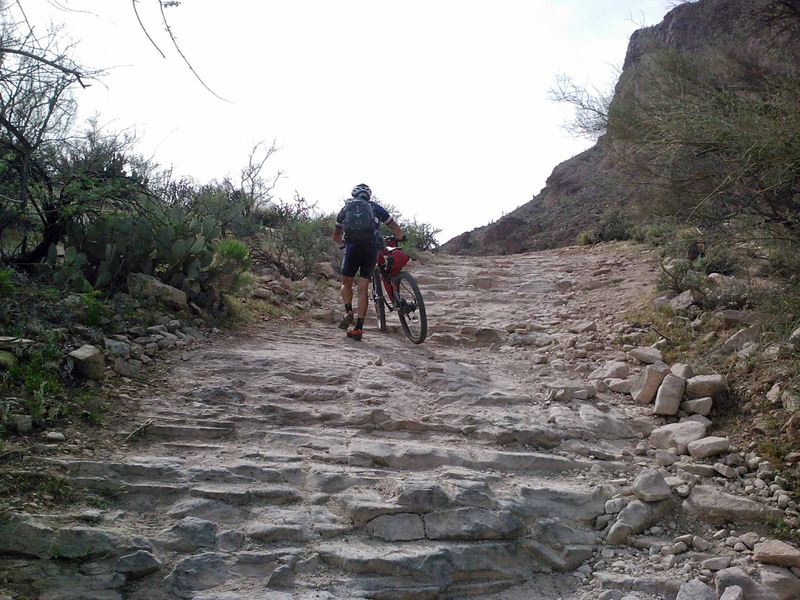 We still had one more off-road section to complete over towards San Tan Regional Park, but there were a few new wrinkles I had added and without a GPS we chose to skip it and finish up on the road. 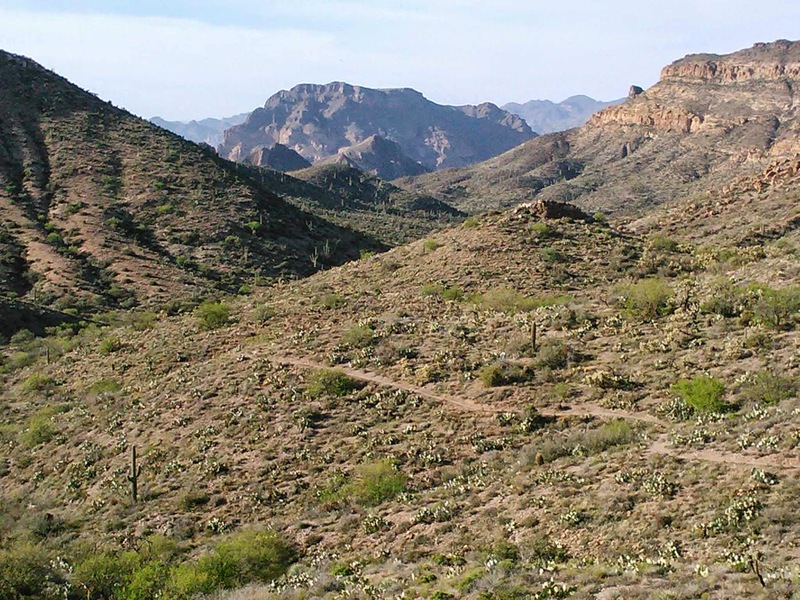 I was a bit bummed about not finishing with a fun whirl down the Dynamite Trail, but more upset about losing the GPS. The pavement miles went by quickly and we finished up around 10p back where we started. Larry, thank you for sticking with it, I really enjoyed your company out there. 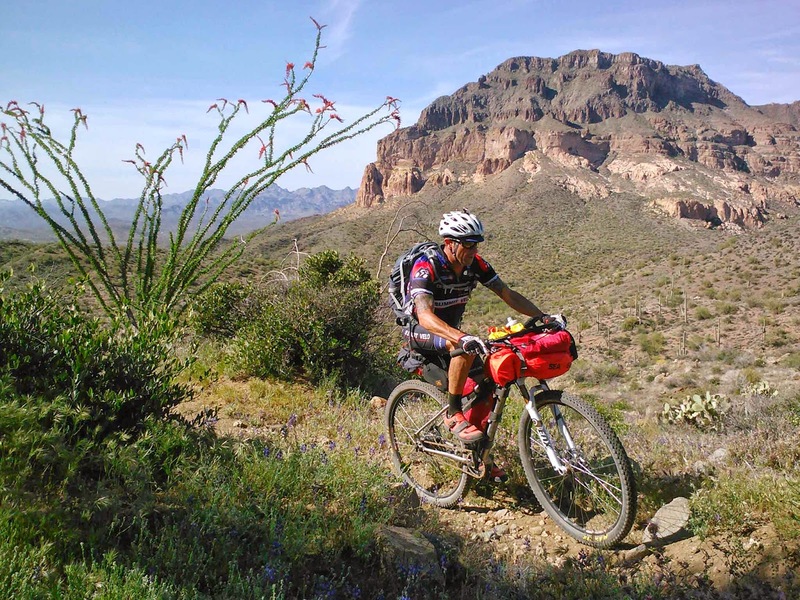 Best of luck as you prepare for the Tour Divide in 2015!! We'll ride again soon. 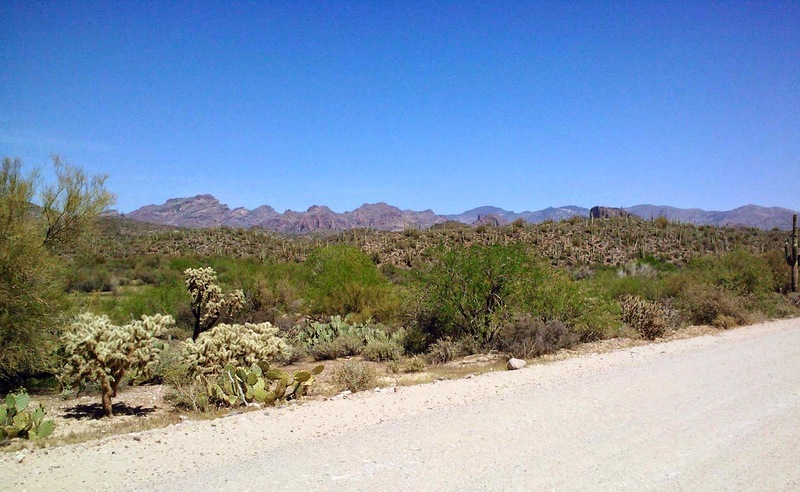 Postscript: The next day I went back out to that lonely dirt road in search of my lost GPS. I headed south scouring the almost white graded road for a black piece of electronics. The miles went by and nothing. I made it out to the last known location I had it. Still nothing. I hoped on my way back the shadows would be different and I simply missed it heading south. About a mile farther down the road an ATV approached, I waved as it sped by, but it had me thinking that someone beat me to it early in the morning. I have my name/address on the back, perhaps a good samaritan would find it? I almost gave up hope of finding it when I crested a small rise only to see it lying in the middle of the road!! Score!! 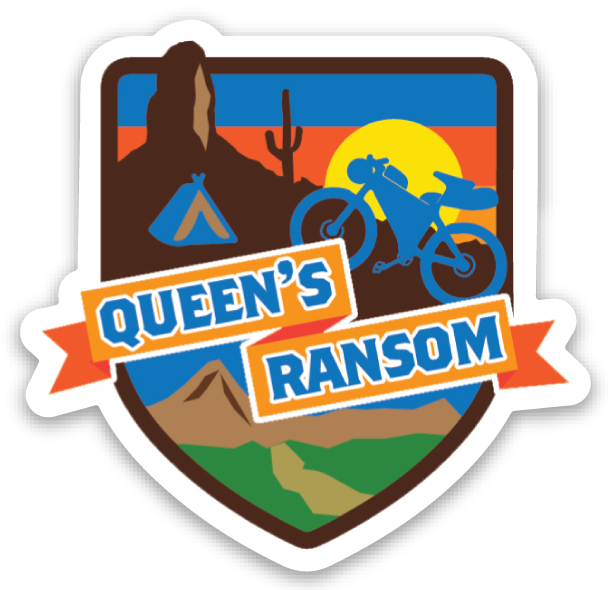 ...The Salty-Gila Tour is now the Queen's Ransom. Yes, it is now ridden in 4 days. We were awake before sunrise, ate breakfast, packed up and were off onto the trails shortly after 7am. It was a beautiful morning, sunny & cool...for now. The forecast was for the upper 80's and this day would be the most demanding physically since we had to ride 30 miles or so before doing the Picketpost to Kelvin segment. That alone is a nice days ride. 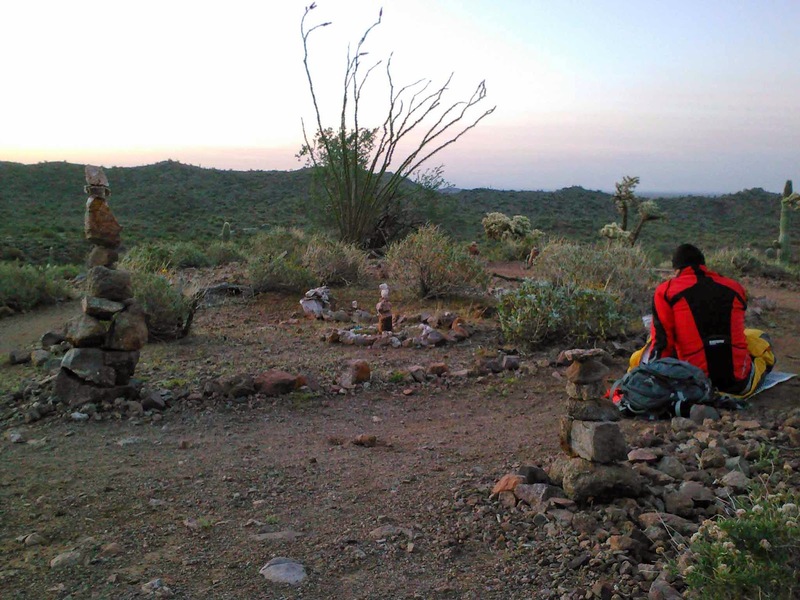 Sunrise over our Vortex camp. Good to see the Whiskey Cactus is still stocked. 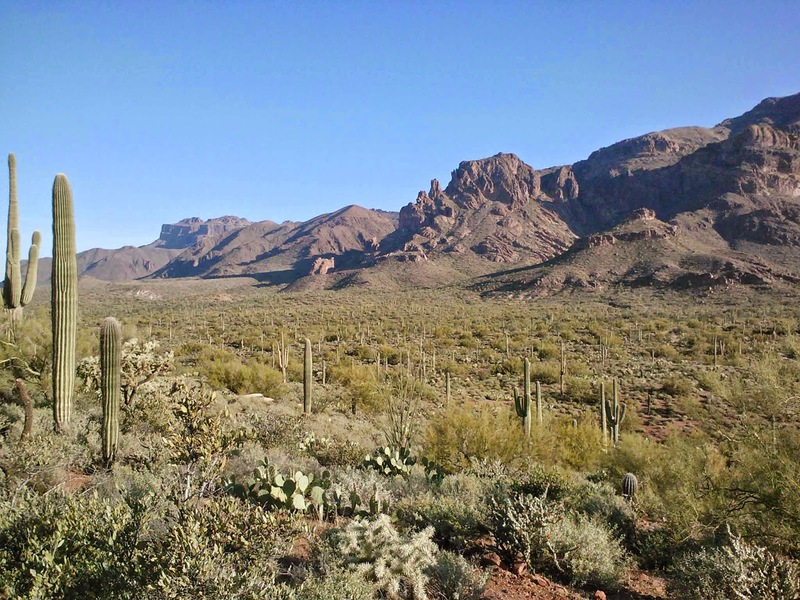 Early morning rays on the Superstition Mtns. 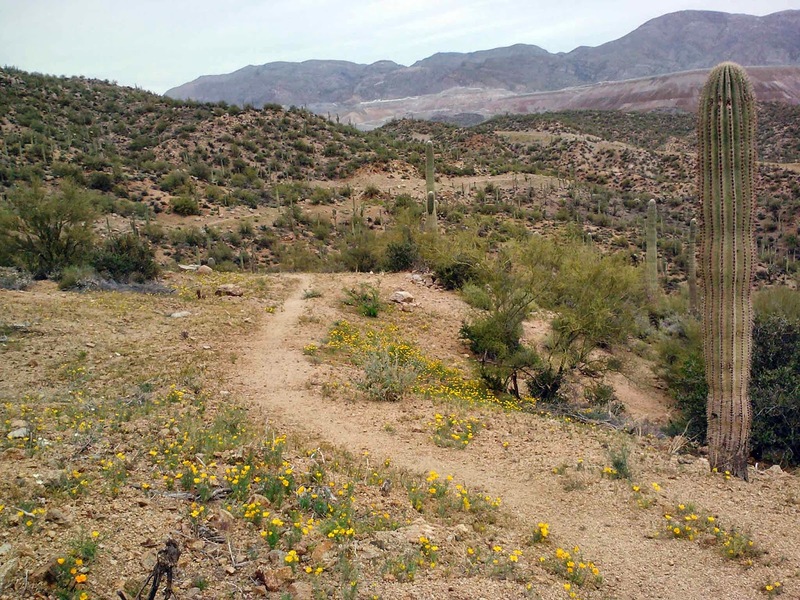 We continued our rollercoaster trail riding onto the K-trail before making our exit from the Gold Canyon trail system. A bit tough to get behind the seat while bikepacking, but it works! Photo by Larry. 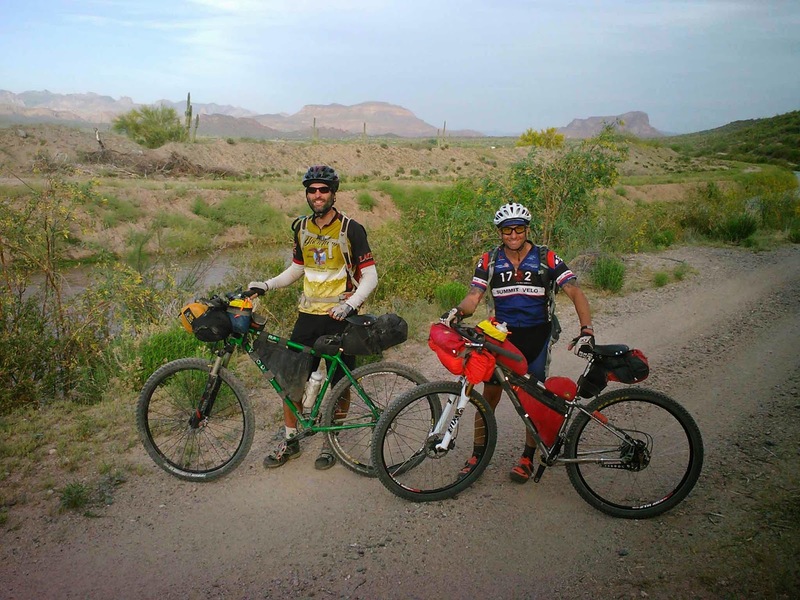 We chatted with a couple buddies setting out for a spin as we made our way onto a powerline connector avoiding the busy US60 shoulder. I had sent Scott a new track for this area, but had yet to ride it myself. 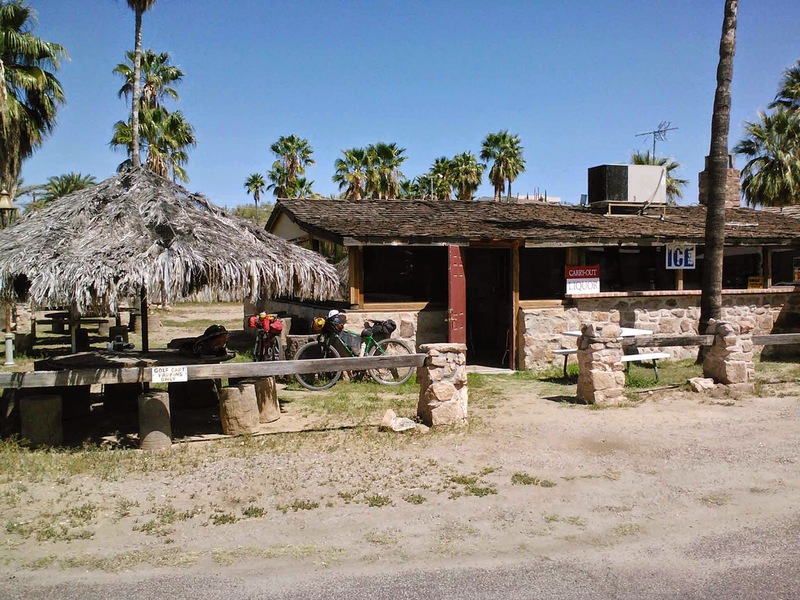 Scott informed me there was a convenience store out in Queen Valley, right on route!! 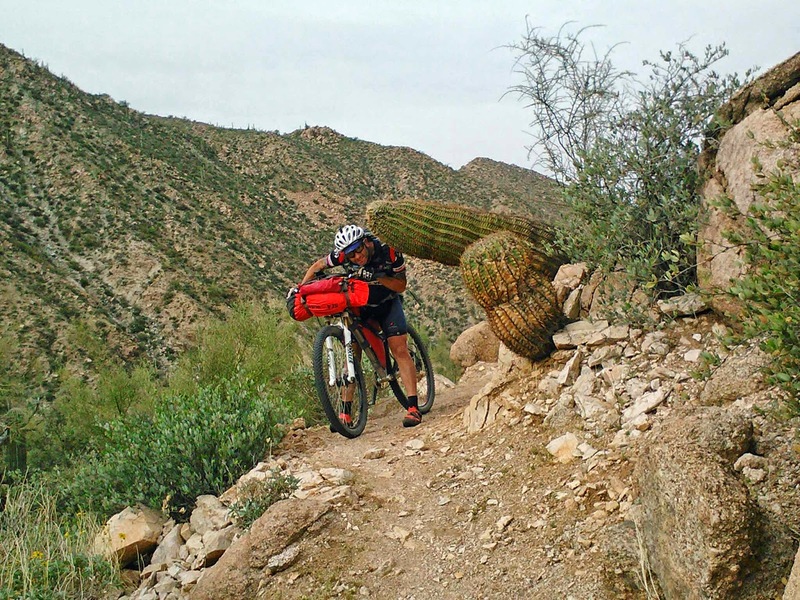 This could be very helpful, possibly cutting out 8 miles of an out-n-back ride into Superior if we needed food/water before setting our course southbound on the AZT. 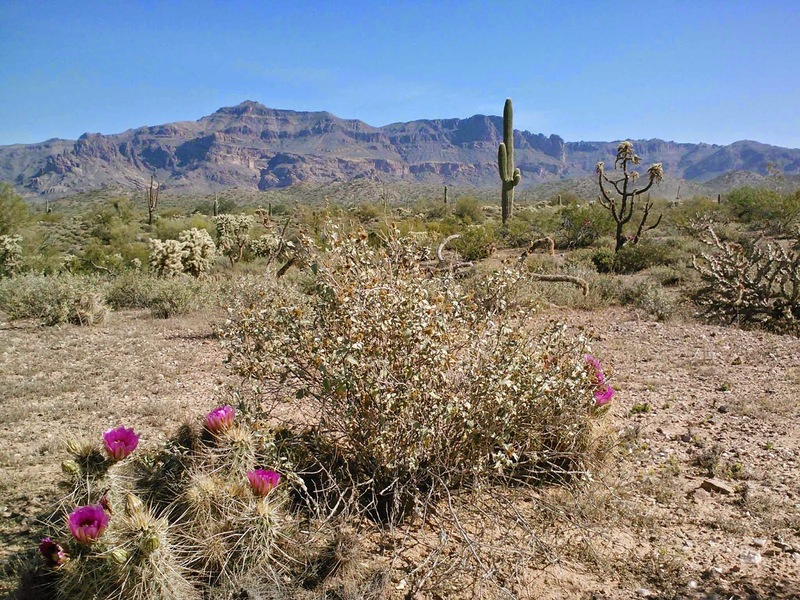 Blooming hedgehogs as we put the Superstitions behind us. Better than 70mph vehicles buzzing your shoulder!! 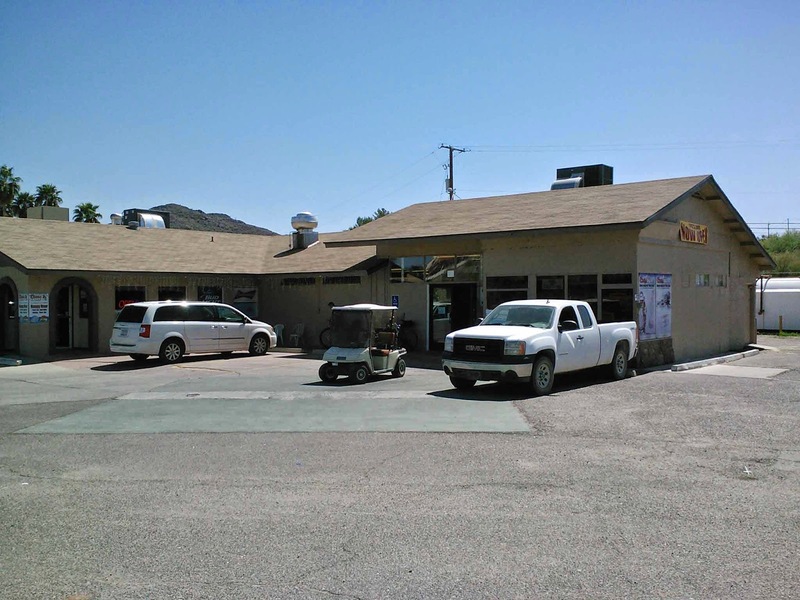 Our only question upon arriving in Queen Valley was if the store was open at 10am on a Sat. It was, but not before we stumbled onto the 19th green's watering hole. We immediately ordered up a couple of ice cold Coke's, ahhh!! Larry enjoying the shade & cold beverage. This was a good place to unwind for a few minutes. Fitz Stop convenience store, open daily. 25¢ water dispenser too. 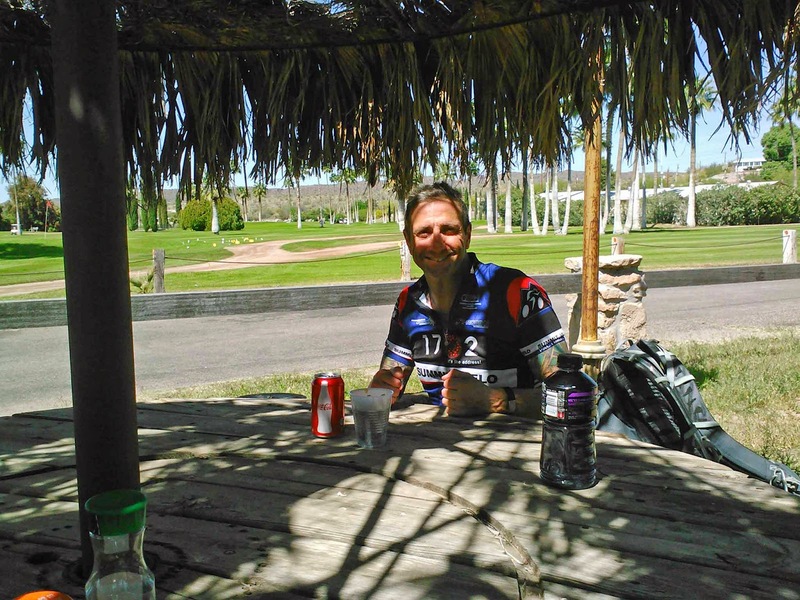 We had plenty of food, but topped off our water to make it down to the Gila River. No need for a Superior stop now. Onward to Picketpost!! It was rather warm, but the miles were easy. During the first few miles of Hewitt Station rd we encountered a number of target shooting enthusiasts blasting rounds into the hillside. It was nice to put the clatter behind us. 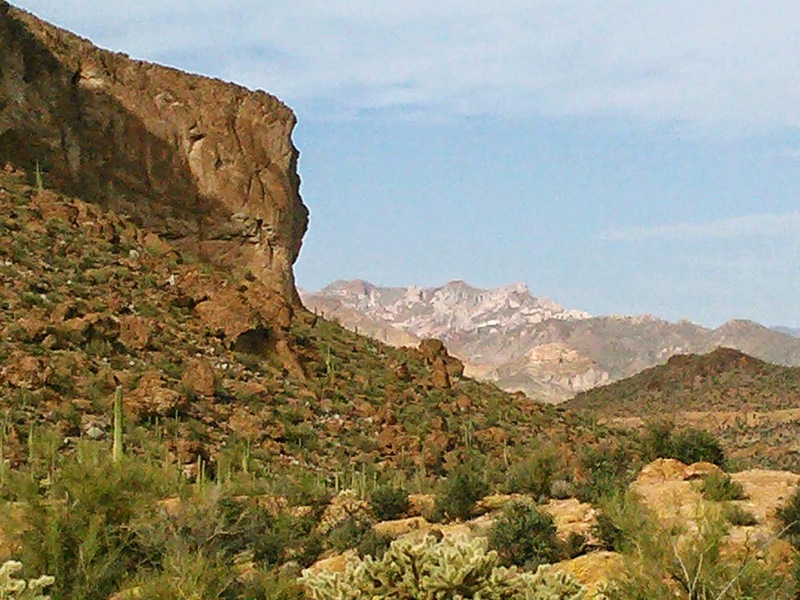 Nice views into the Superstition Wilderness from Hewitt Station rd. 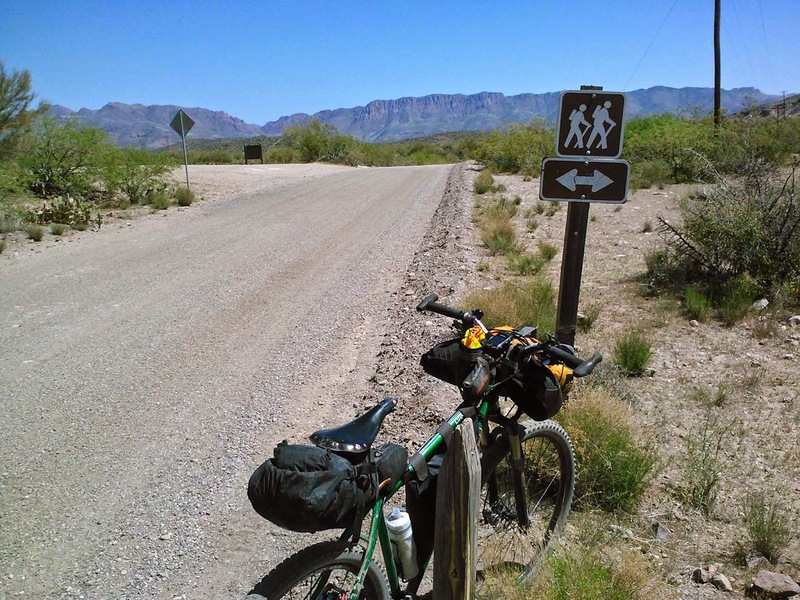 It was just after noon when I reached the AZT junction. I was a bit in front of Larry, so I found some shade as things were really starting to warm up. I wasn't super excited about climbing the next 14 or so miles into the heat of the day, but we could take it easy. It's a TOUR afterall. 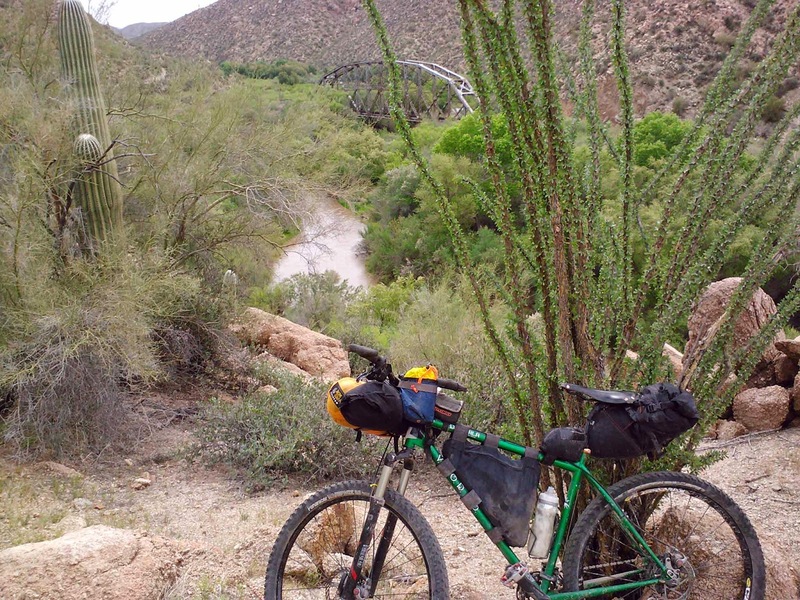 AZT junction, Apache Leap in the background. 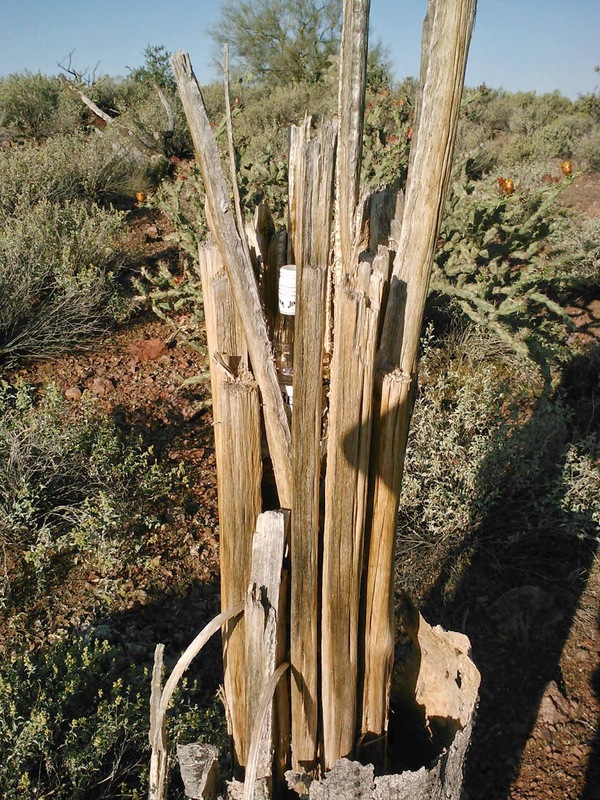 Each gate on the AZT seems to have its own character. 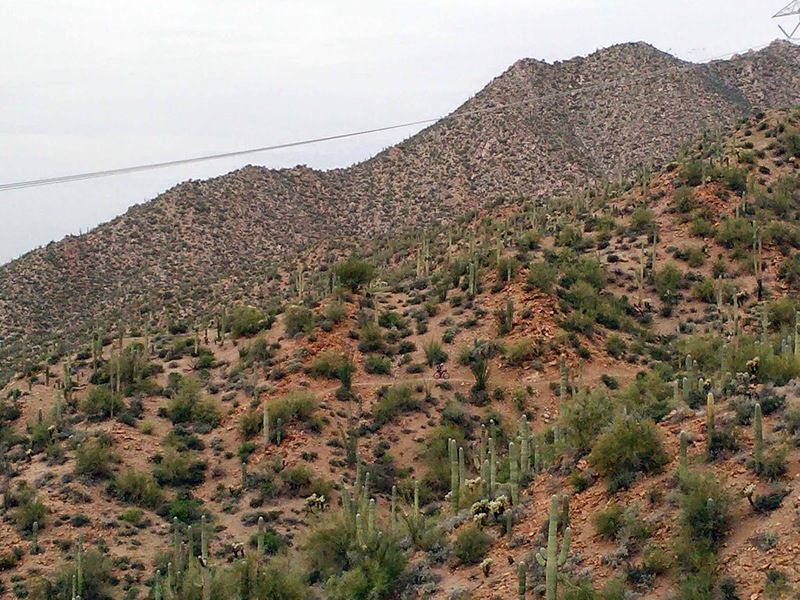 Picketpost Mtn. from the north side of US60. We arrived at Picketpost trailhead sometime around 1:30p. There were a bunch of cars in the lot, which is rather unusual for this place. As we were rolling through a decent sized group of riders were finishing up a nice OnB ride to the 10-mile overlook. They too were inquisitive regarding our setups and destination. 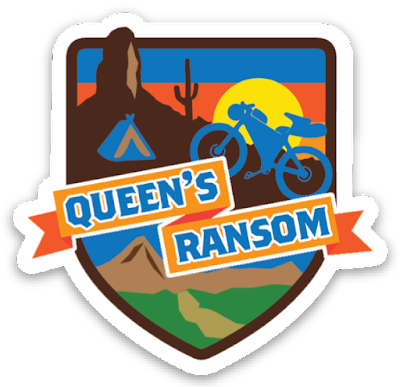 We talked with them for a bit then noticed two others getting prepped for a bikepacking outing of their own. One of the riders, Holly, was walking by and asked what we were up to. 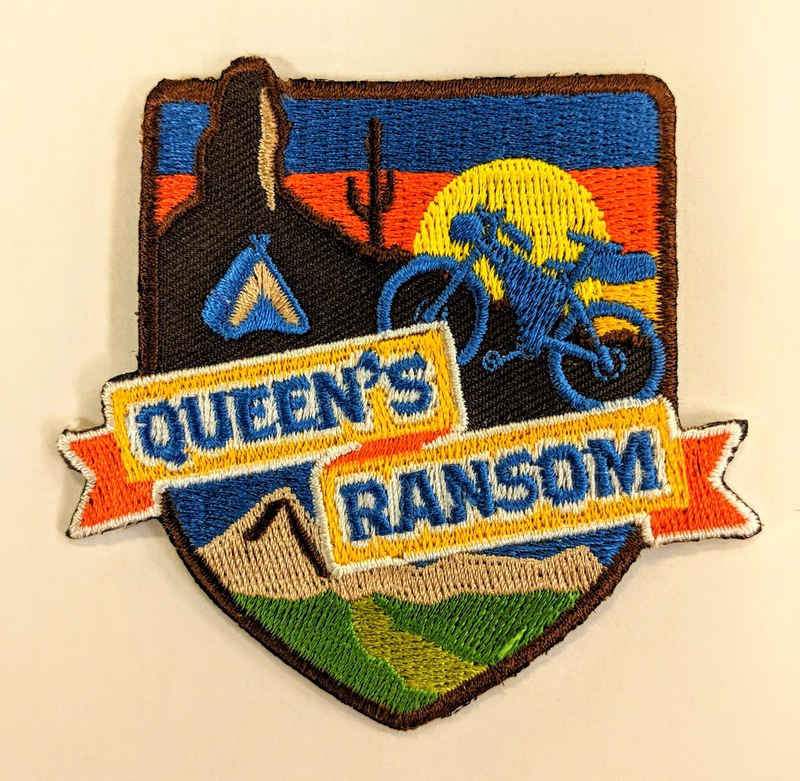 When I told her she mentioned this was her first bikepacking ride and they were getting prepared for an attempt at the AZT300 in a couple of weeks. I told her I had done the race a year ago and she insisted we talk to her partner, Josh. It was cool to hear their enthusiasm about the race. 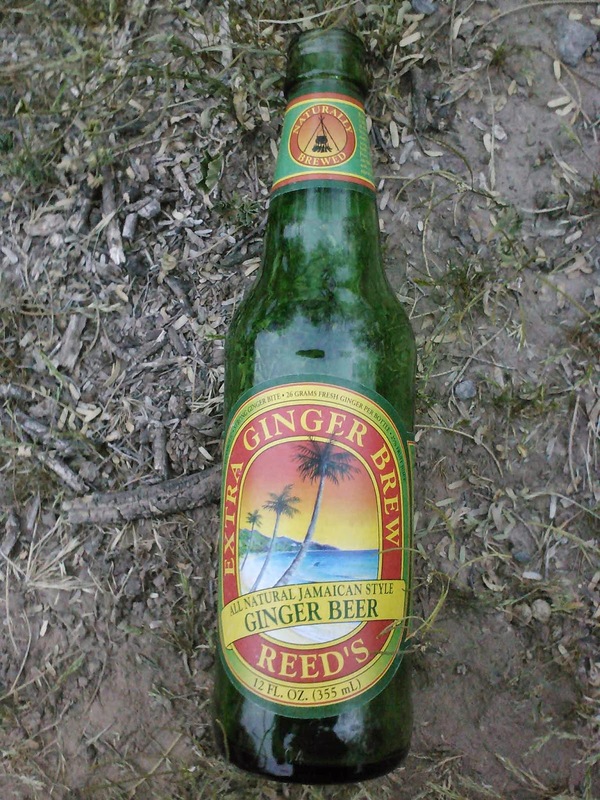 As we were getting set to leave they handed us a couple of ginger beers for dinner, ahh trail magic. We told them to look for us down by Kelvin if they were heading that way, but we wouldn't see them again. 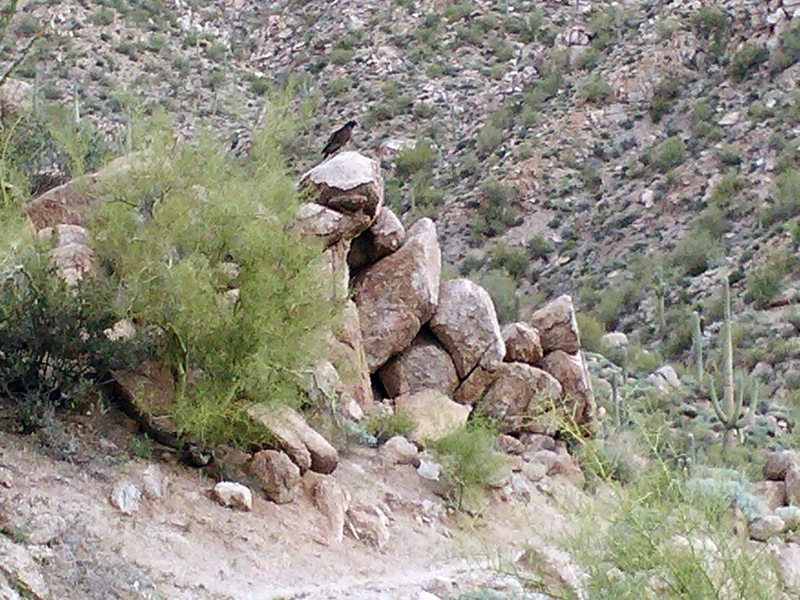 The other group was still missing 3 riders as we left the trailhead and asked us to keep an eye out for them. 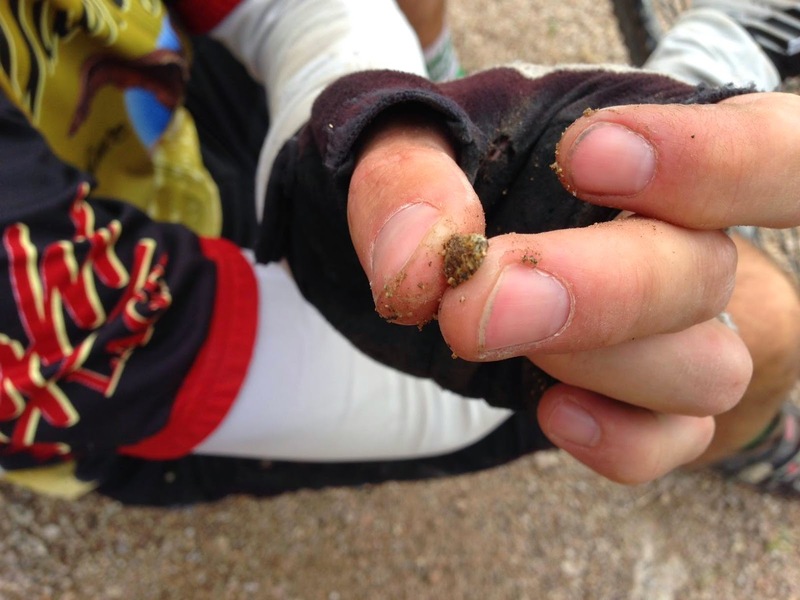 It wasn't long before we came across a cramping rider, walking back to the cars. 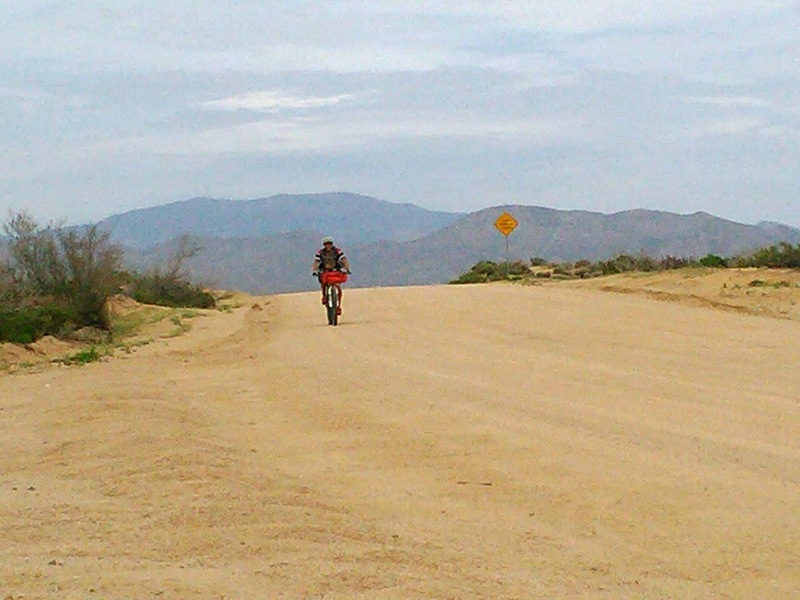 A few minutes later I found my buddy, Joe, accompanying another fairly toasted rider back to civilization. 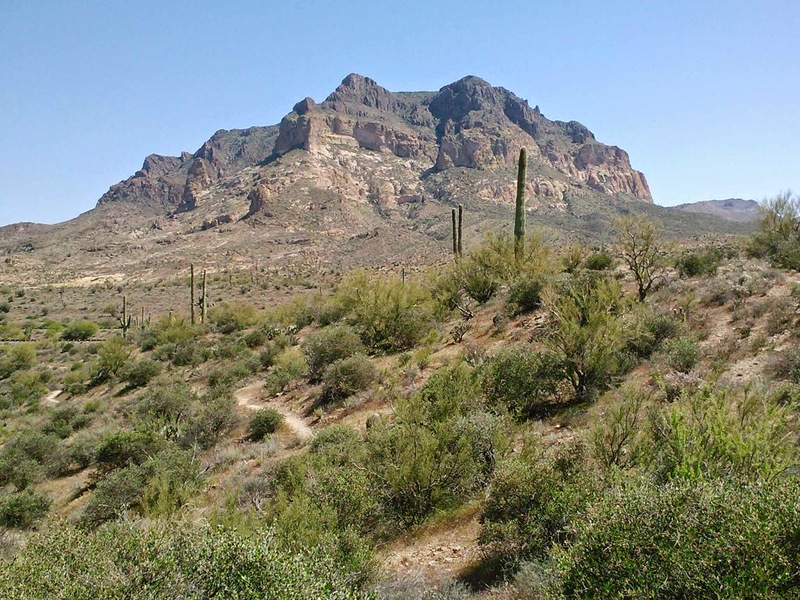 It was warm, borderline hot, in the mid-80's and we had a bunch of climbing to do over the next 14 miles. I made sure we didn't push too hard, taking advantage of the few shade spots along the way. It took longer than I had anticipated, but with no set camping location it didn't really matter. We only wanted to be past our water refill spot before setting down for the night. 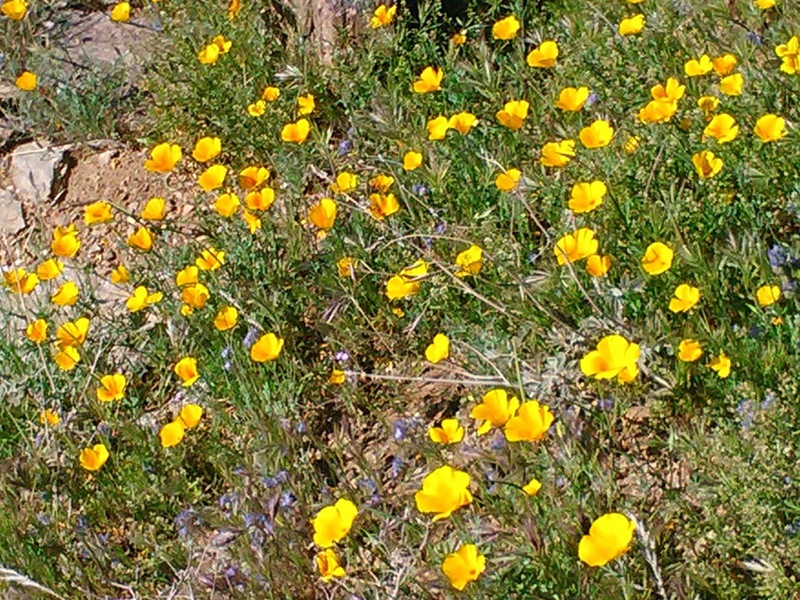 The wildflowers came in doses along the trail. The first of many spectacular overlooks heading south. Larry on a ribbon of dirt. Shade AND grass?? oh, yes. 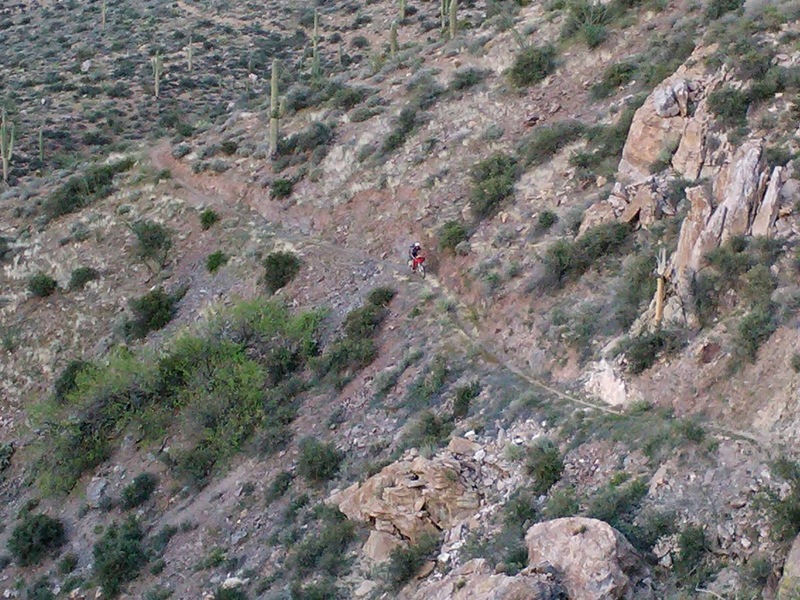 Climbing towards the 10-mile overlook. Rounding a corner on the ensuing descent I almost ran over this guy! Golden hour hits Martinez Canyon. I love riding through here, one of the best segments in the state. Even better showing a first-timer the views. The late afternoon brought relief from the warmth. 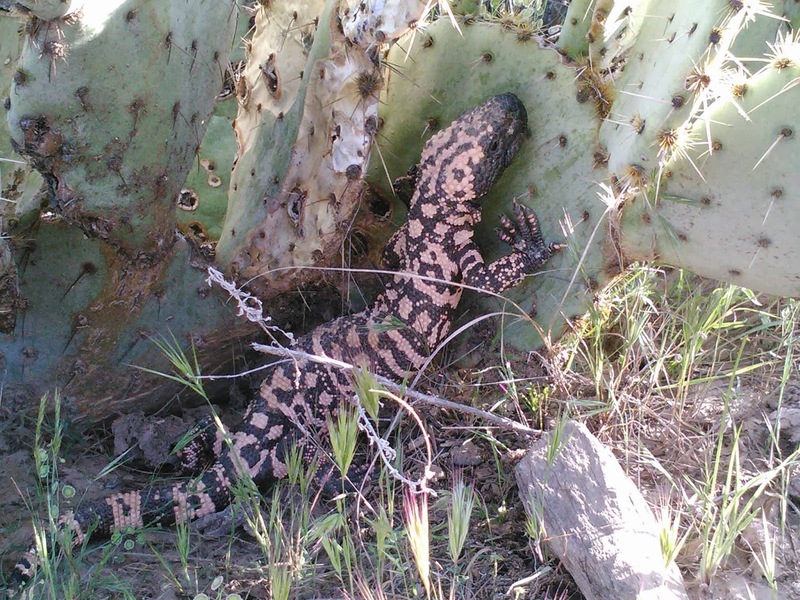 Two Gila Monsters in one hour!! I had to chase this guy around for a bit before he paused in the sunlight. 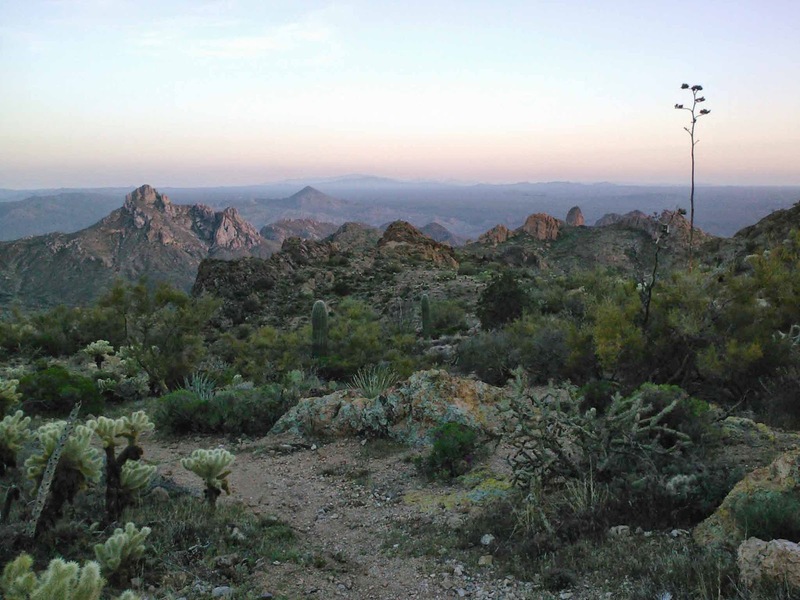 Postcard view from the Gila saddle at dusk. It was time to don the light setup and grab a snack. 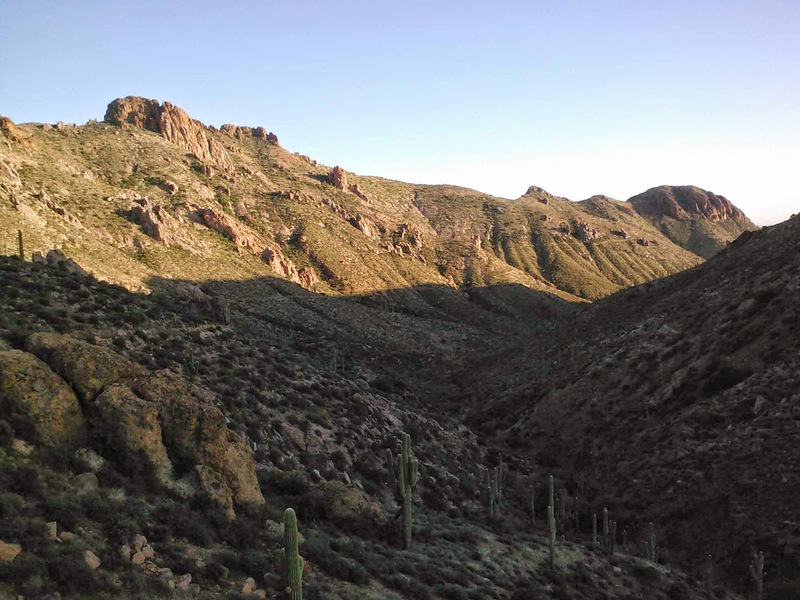 The last glimmer of daylight left us as we began the 6 mile descent to the Gila River. A couple of times I stopped to watch Larry's light dance on the switchbacks above me, barely making out the towering silhouettes surrounding us. Before long we reached our watering hole, it was dark as ink without the lights down there, but we could tell the river flow was high. 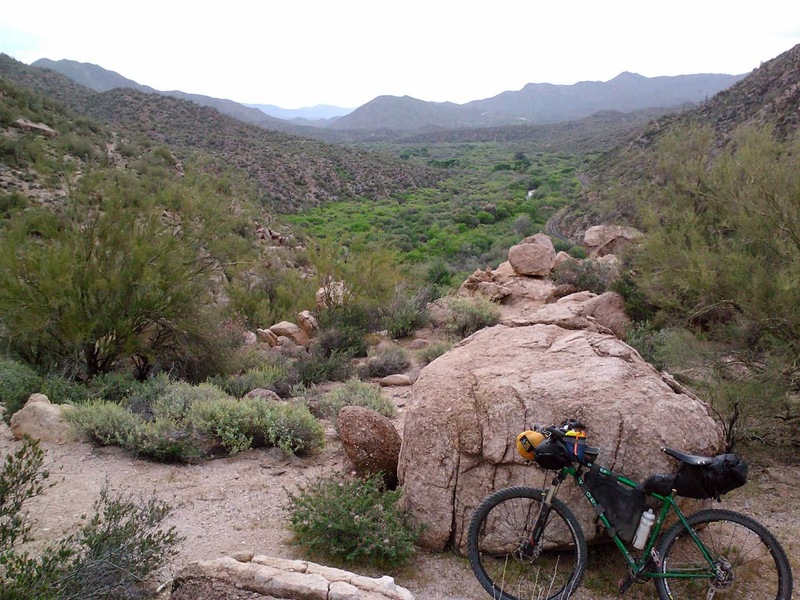 I made a deal with Larry, we'll camp along the river somewhere instead of the Kelvin trailhead still some 18+ miles away. I knew there was a new gate ahead a few miles that signaled the end of this piece of singletrack. We'd either ride out close to the gate or stop when my GPS batteries died for the night. Well worth the little bit of extra weight. The GPS lasted, and we found a grassy tree-lined area for the night. I cooked up my dinner & cracked open that ginger beer, what a treat! Two nights in a row we dozed off under a canopy of stars, this time we had the gurgling river as a soundtrack.